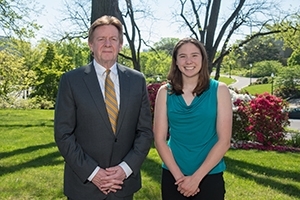 Lapping the Field: Shannon Scovel Wins the President’s Award | American University Washington D.C.
American University President Neil Kerwin and the President's Award recipient, Shannon Scovel. When she was initially applying for colleges, Shannon Scovel was thorough. In a part college tour-part fun excursion, Scovel and her mother visited 22 different schools. After arriving at American University, she observed some student character traits that she hoped to emulate. Years later, she’s passed that test with flying colors, earning the top distinction for undergraduate students at AU. Scovel is this year’s recipient of the President’s Award, given to a graduating student whose accomplishments are truly exceptional and reflect AU’s highest ideals. “It was all such a whirlwind. I didn’t actually think that this was something that I could win,” she says. Yet, looking at her résumé, getting this award is less surprising than how she managed to navigate such a loaded schedule. She was on the swim team for four years—eventually becoming team captain—and she’s set to graduate with nearly a 4.0 GPA. She also worked at The Eagle and served as editor-in-chief in 2015-2016. In her view, athletics fueled her scholastic achievements. “I think swimming really helped. I had a team, so I was accountable to them. I was doing my academics for me, but I was also doing it for the team,” she says. The Patriot League publishes everyone’s spring semester GPA, and AU Swimming and Diving Coach Mark Davin incorporates academics into the team culture. “There’s a sense of pride in doing well in the classroom,” she notes. For Scovel, it wasn’t just about getting A’s. She’s learned how much she enjoys learning. “That’s something I didn’t know about myself. I didn’t realize I was that academic-minded. I knew I liked school, but I didn’t know that I’d definitely want to continue with it after college,” she says. She’ll now go to Scotland on a Fulbright scholarship, pursuing her master’s degree in gender studies from University of Stirling. Scovel will continue to focus on her primary interest: media representation of women in sports. She wrote her AU Honors capstone on that same subject, and she interviewed 25 women and men about sports media—from writers and editors to scholars and athletes. She even got some email insights from Olympic gold medalist swimmer Missy Franklin. Why are women underrepresented in sports coverage? Among other findings, Scovel points to the fact that about 91 percent of sports editors are men. “Until that number goes down, and there’s more equality there, we’ll never see more coverage of female athletes,” argues Scovel. She also got job experience interning with Sports Illustrated and USA TODAY. And AU connections opened up other opportunities, like reporting from the Washington Wizards locker room and a recent trip to the White House Correspondents’ Dinner. Scovel will earn her bachelor’s degree in journalism with a minor in political science. She’d love to do longform Olympic sports reporting, and she’s contemplating a future in academia. At AU, she swam the distance freestyle, and she seems to have taken the long view throughout her life. But she didn’t divert her eyes from the tasks right in front of her. When she recently got the call that she won the President’s Award, she was walking to her public speaking class for her last assignment. She was ecstatic about getting the award, and she called both her mother and father to share her moment with them. But Scovel didn’t have time to celebrate, and she kept the conversations brief. It was time to go to class, to give that one final speech.